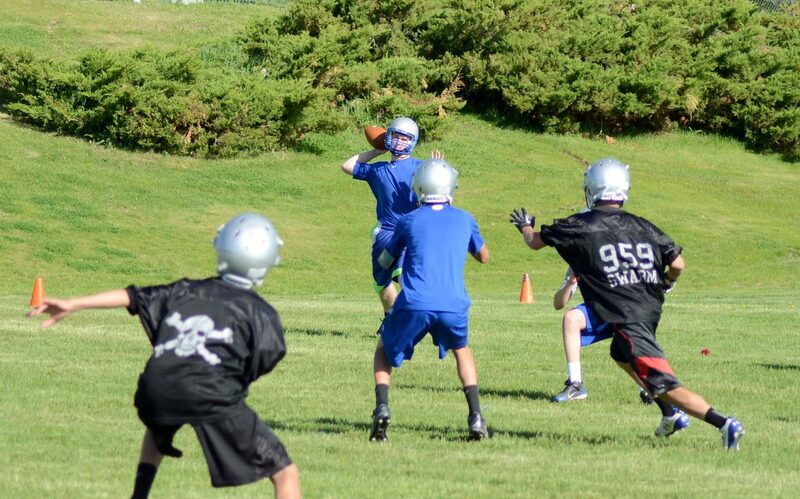 Keenan Hildebrandt winds up to pass to Connor Scranton, center, while defenders swarm to the ball Tuesday morning at the Moffat County practice field. The Bulldogs football team has been working on strength, speed and its offensive and defensive sets to start the summer. Craig — With almost three months until the season starts, the Moffat County football team isn’t waiting to get better. The Bulldogs suffered through the team’s worst season in years in 2013 and want to enter the 2A Western Slope League with a bang. So a large, dedicated group of players is putting the time in this summer to get the team rolling early. Anywhere from 35 to 50 Bulldogs have been showing up for morning workout sessions since last week, getting stronger, faster and sharper for the upcoming season. A large contingent of the players there are underclassmen, after last season’s freshman and eighth-grade football teams had a great deal of success on the field. But Hafey thinks the seniors in attendance are a major reason such large numbers have been turning out consistently. On Tuesday morning, the Bulldogs spent most of their practice in seven-on-seven football, going over their offensive and defensive sets and principles. Now entering their third season in the new spread offense, the players look even more comfortable with the plays they will run this season. Where in past seasons, coaches would call out a play and there would be discussions about what those signals meant and where certain players needed to go, this year the players recognize the calls and the discussion is more focused on what happens after the snap. Moffat County will take what it’s worked on in the first few weeks of practice to team camp in Wyoming from June 18 through 20. There, they get to play their only full-contact football of the summer, until Colorado High School Activities Association-sanctioned practice begins in August.